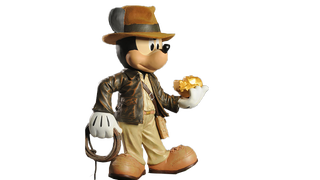 Mickey Mouse now owns both Han Solo and his whip-bearing twin Indy—Disney has purchased the rights to the Indiana Jones franchise from Paramount, the film group that distributed the first four films in the beloved action/adventure series. Variety's got the scoop. Disney can now produce and distribute new Indy movies. Get ready for Indiana Jones 5: Goofy's Revenge.